Cat hair loss can seem quite alarming if you discover your cat is suffering from it. 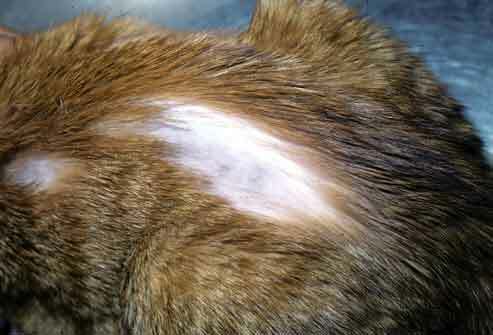 After all bald patches and exposed cat skin is not a pleasant sight, especially if your cat is also in distress. Hair loss can be caused by various conditions and is often accompanied by extreme irritation and misery for your cat. It is therefore important to treat the problem early and correctly to prevent things getting even worse. Because hair loss can be caused by many different things it usually requires the expertise of your vet to make a correct diagnosis. Skin scrapes may have to be taken and analysed before the correct diagnosis can be given. 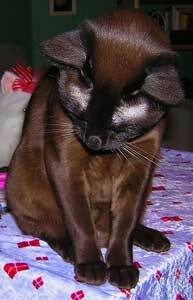 If the underlying cause is not treated, it could eventually result in a bald cat although this is rare. It is far more common for bald spots to appear over the body. Cats shed dead hair all the time through the year which is why they groom themselves so often (and get fur balls!). Depending on the cats living circumstances some cats will also have a heavy seasonal moult, usually in the Spring. So the fact that your cat is losing lots of hair may not be illness related. However bald patches should not appear due to normal shedding. A change in their environment such as new decoration or new furniture. The arrival of a new baby or another pet can also cause stress. The loss of a companion. Yes even cats can suffer grief for another pet, although it can manifest itself differently than it does in people. Pregnant mother cats can lose hair during the pregnancy or while lactating, this could be due to changes in hormones . However the fur should grow back after a short period of time after the birth. 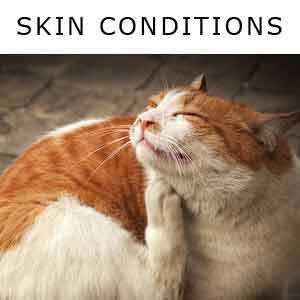 This list is to give you some idea of the range of skin problems which could result in cat hair loss. It shouldn't be used for diagnosis as these are just for example. Always consult your vet if you are concerned about your cats health and well being. Over Grooming- A stressed cat will often display their unhappiness by over grooming. This often occurs in only a couple of areas on the body which will eventually wear away the hair and expose bald spots. Treating the cause of the stress is obviously your first concern but if the over grooming has also caused sores or even infection on the skin, you will need to treat that too. If the hair loss is more all over it may indicate a hormone imbalance or other reason. Itching - This could be caused by many things, such as allergies, fleas, mites or fungal infections. You should check your cat for signs of any parasites and treat accordingly to see if the itching subsides. If none can be found a vet will have to do some tests to find the cause of the itching. 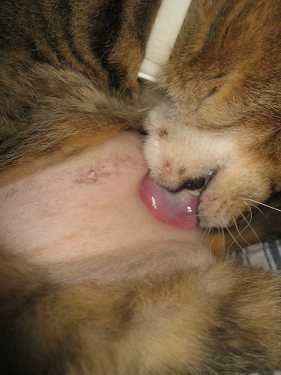 Ringworm - Cat hair loss in oval or round patches is often a sign of ringworm which is very contagious and most common in kittens and long haired breeds. Ringworm is not an actual worm but is a fungal infection. If your cat has developed bare, red patches these should be treated as soon as possible and precaustions should be made to avoid furthr spead to toher memebers of the household. Your vet will be able to prescribe a medication. 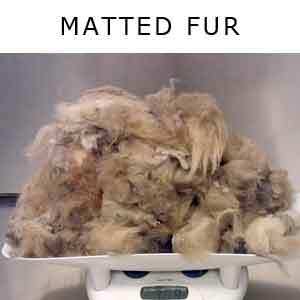 How Will The Vet Diagnose The Cause Of The Hair Loss? How long has your cat had the problem? 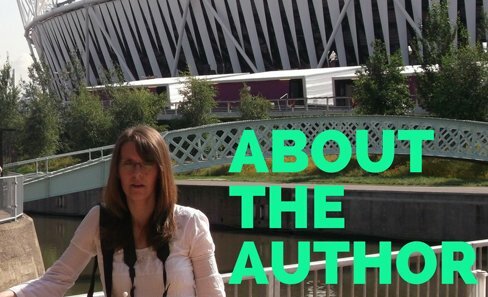 Does it come and go? Is your cat showing any other symptoms of poor cat health such as vomiting, diarrhea, weight loss or loss of appetite? Is the problem in just one area or all over you cats body? Has there been a change to the cats diet or environment, such as using a new household cleaner? Take skin scrapings and hair samples for analysis. Take blood tests, or a skin sample for biopsy. They might consider performing hypo allergenic diet trials. If you are lucky then the result may be an almost instantaneous return to good health. Other cases may take months to fully resolve. So always consult your vet at the earliest signs of cat hair loss or any skin problems, and take into consideration your own health and any other pets in your household, who may also be suffering from something similar. The sight of your cat itching like mad can be very upsetting. Here is a couple of natural remedies designed to relieve itching.